A cleansing and make-up removing water that respects the fragility of sensitive skin. 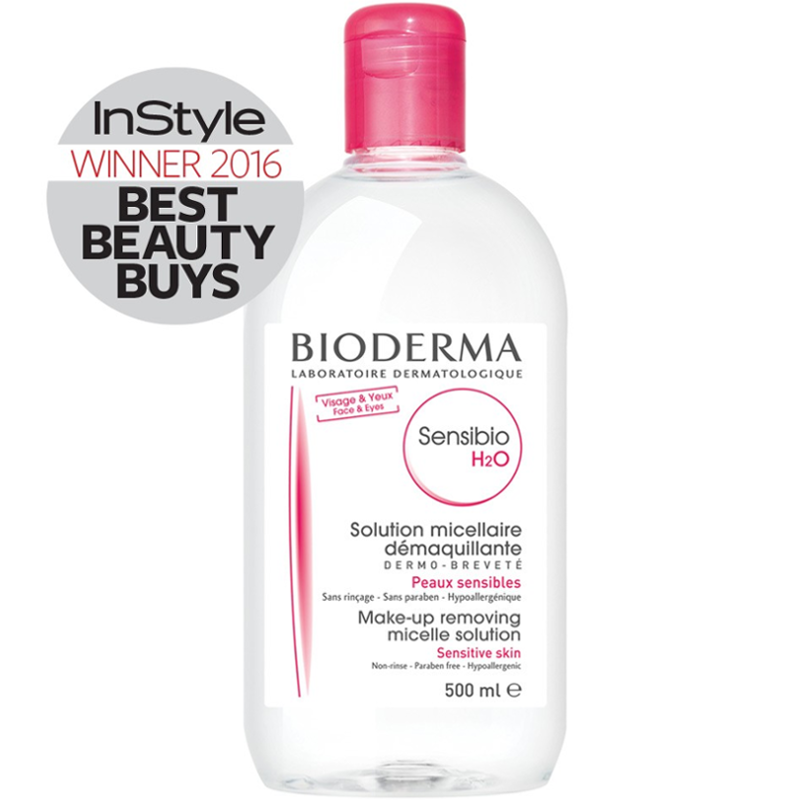 Sensibio H2O is the 1st and only dermatological micellar water perfectly compatible with the skin: its fatty acid esters, the constituent elements of micelles, are similar to the phospholipids of the skin cell membranes?and naturally help rebuild the skin's hydrolipidic film. • The micelles contained in its formula effectively micro-emulsify impurities while maintaining the skin’s balance (soap-free, physiological pH). - Soak a cotton pad with Sensibio H2O and cleanse the face and eyes and/or remove any make-up. - Repeat the application until the cotton pad remains clean. • Sensibio H2O can be used daily, morning and evening. 7 days a week. Personally I don’t think this is anything special and Garnier sell a similar product for lot less money that does the same job as I have tried it and used it before I used this sample. I would not buy this at the price it is selling for but obviously others think it is worth the money as one bottle of Sensibio H2O sold around the world every 5 seconds! It does cleanse my face but I am not happy leaving it unrinsed on my face . I would not use just this and then not rinse and tone then moisturise my face. I prefer natural products so will stick to my natural plant based oil cleanser and natural floral water as my face feels better and cleaner with those. If you are interested in trying a micellar water then check the ingredients and compare and you will find that High street brands like Garnier offer a cheaper and equally effective option. This is not water for drinking but to cleanse your face. This particular one is created for sensitive skin . It claims to even remove waterproof make up which is pretty amazing as I struggle to remove waterproof eye liners and mascara as I don’t want to scrub at my eyes. They say it is not only good for using on sensitive skin but it also soothes and clears up irritated skin. They also say it leaves you feeling refreshed and clean and you don’t need to rinse it off after cleansing with this. This was great for travelling as it meant I only had to take one bottle as opposed to a cleanser and toner as this did both. There is no added fragrance to this so it really has no smell at all which is a good thing fr anyone avoiding artificial fragrances. It is also alcohol free so great for sensitive skins. It is also free of those horrible parabens or no phenoxyethanol and is hypoallergenic too. It is quite gentle and certainly I had no adverse reaction when using my sample bottle. The fat that is has no alcohol helps stop the skin from drying too much and is one less ingredient that can cause skin irritation. It does feel nice and cool on my skin which was nice as we were in laces where the temperature was quite high and my face had been out in the sun all day. Sensibio H2O guarantees that their formula is not only gentle on the skin but also is safe for use around the eyes which is good considering it is supposed to remove even water proof mascara. It is PH balanced so matches the skin PH and is soap free hnce no stinging in the eyes. I found it quite effective at removing make up. I kept on wiping with cotton pads until my face was no longer giving off any colour at all. Would I use this instead of my oil based cleansers and toners etc? Probably not as I do like how my face feels after using my oil based cleansers, it feels clean and yet not dry at all. When using this water stuff my face felt clean but slightly less moist or more parched and it felt like it was desperate for its moisturiser. It just wasn’t quite right, not having to rinse it off felt odd and it did have a very slight tacky feel to it. It is basically water with some added ingredients but water is the first ingredient. The next ingredient n the list is PEG-6 Caprylic/ capric glycerides which are derived from coconut oils. The next is cucumber extract which is soothing and gentle and cooling. Mannitol is next and that is actually a sugar alcohol so it does have alcohol!! This is added as it s a humectant which means it traps in moisture and is a skin conditioner. Xyliol is another sugar alcohol often found in toothpastes but in this it is added because it is also a humectant and it is said to help the skin retain its natural moisture and boost levels of hyaluronic acid, a natural lubricant that assists in collagen production. Rhamnose is naturally occuring sugar that is said to be an anti winkle agent. Fructooligosaccharides are yet another natural sugar and are natural alternative to retinol. They are said to have the same benefits such as collagen synthesis and UV protection. They are also also natural emulsifiers and conditioners. Disodium EDTA is as a preservative, binding agent and stabilizer, as well as being the foaming and cleaning ingredient in this product. Cetrimonium bromide is a ammonium salt it helps the oil mix with the water in this and also help the mixture form large micelles, or emulsion droplets. Oil-in-water micelles are clusters of molecules with an oily center which is what makes this product a micelle water I guess. So it is not all natural and does in fact have sugar alcohol ingredients so not quite what they say. As you might suspect this is mainly water. But apparently they add some magic molecules to water to make it attract dirt and grease from your skin. These special magic molecules are a mixture of oils and some natural acids hat ar supposed to cleanse and tone our skin more naturally. I don’t really understand the science and it may well be a big con but these with more scientific knowledge than I have may understand. I got a trial size of this from a beauty box and was rather interested in trying this as I needed a new make up remover. I have heard quite a bit about it however you don't know until you try. So it was rather easy to apply to a pad, very watery and has no scent. Taking off foundation took quite a few goes as for mascara, I had to use a specialist eye make up remover as it was taking a while and a lot of the mascara was not budging. It is a very mild formula and I believe this may be the reason it is not as effective as I thought. My usual make up remover takes it all off in 5 pads, this took around 15 and I could still get make up off after with another cleanser. I wouldn't recommend it at all for make up removing, however it cleanses naked skin very well. Very easy and quick to use. Would be a good first cleanse if you are a two cleanse person. I don't felt it stripped off all my make-up - may be if you kept going for several rounds of cotton pads. This product has so much hype from the bloggosphere that I was really excited to receive a trial size and test it for myself. I probably rate it on par with other cleansing/micellar waters that I've tried. It is a no-make-up day cleanser, first cleanse or late, late night, lazy cleanse. It's definitely not the best thing you can use on your skin to treat it well and remove make-up, however it has it's place. I will be interested to see how it compares to other versions on the market and will keep a bottle of some micellar water or other in my cupboard but it will never be my daily cleanser. It's taken me a long while to get around to trying this just because it's not exactly the most exciting thing around and I've always had other priorities. But as I was ordering something else from the site that stocked it anyway I thought I might as well pop a mini in my basket. As for the product itself, honestly if someone emptied the bottle and pured in my usual makeup remover (the Simple Kind to Eyes Eye Makeup Remover) I really don't think I'd actually notice. The Bioderma was potentially slightly better but maybe that's just because I wanted it to be. If it is better then it's so slightly that I didn't notice a difference even though I've been using the Simple one for absolutely years now. They both look exactly like water and they both remove my makeup. They do both struggle a bit with my liquid liner (takes several attempts for my Urban Decay 24/7 liquid, even more for my Loreal superliner) and even more struggles when it comes to Benefit's They're Real Mascara. As for the price comparison between the two, the Simple one is £3.39 for 125ml and works out at £2.71 per 100ml. 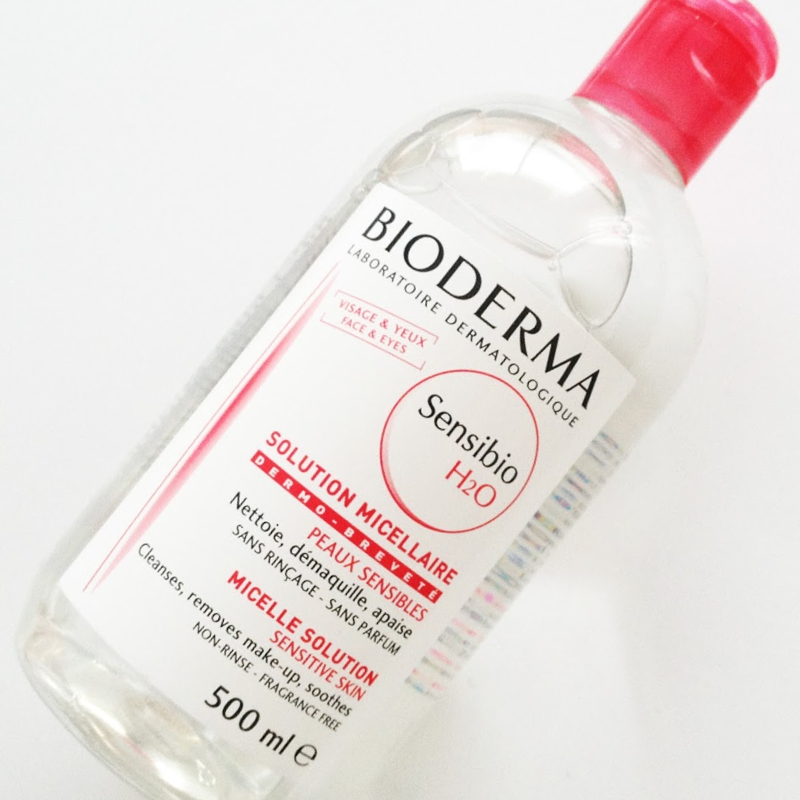 The 100ml bottle of Bioderma I purchased was £4.50 but I only purchased that to try it out, if you're going for the 500ml bottle it's £14.50 and £2.90 per 100ml. Obviously this isn't taking into consideration the fact that Simple is quite often on 3 for 2 in Boots. While Simple is cheaper, it's not dramatically so. The Bioderma is a good remover, but I just don't understand such hype when really to me it's the same as the Simple one. 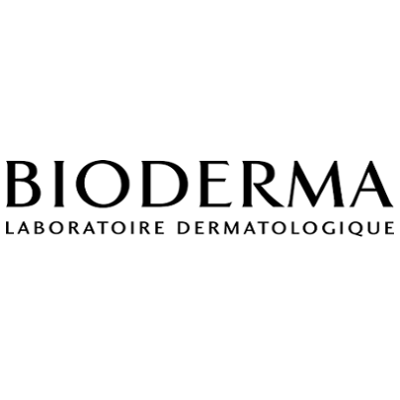 There's a possibility that maybe people prefer the ingredients in Bioderma (I pay absoltuely no attention to ingredients, so honestly haven't a clue if they're similar or not) or it's better at removing certain types of makeup (though I wouldn't see why?) but for me they seem to be the same. Saying that I am tempted to buy the 500ml when I run out of both of these, just because I go through my 125ml bottles of Simple so quickly and feel like I'm popping out to buy another one every 5 minutes, but if for whatever reason I can't get hold of it I wouldn't really feel like I was missing out. I wish this was easier to get because I can't find a make up remover that's as good and simple to use. "Personally I don’t think this is anything special and Garnier sell a similar product for lot less money that does the same job as I..."